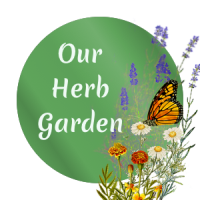 When I started Our Herb Garden, I wanted to primarily focus on edible herbs. But, that would mean I couldn’t talk about many of my favorites. 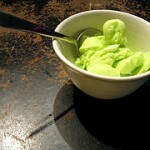 Granting myself an exception, today I’m sharing with you one of our favorite non-edible herbs. We absolutely love growing lily of the valley in our garden. The aroma is heavenly. And, the sweet little white flowers are such a lovely way to herald spring each year too. 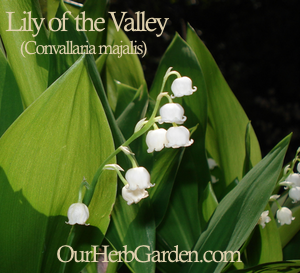 Best of all, growing lily of the valley is super easy and the plants don’t require much care, once established. 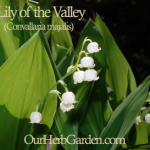 The Latin name for lily of the valley, Convallaria majalis, is fairly descriptive of the plant – convallis translates to valley and majalis is “belonging to Mai.” Most translate it simply to May. More accurately translated, it refers to the Roman goddess Maia for whom the month was named for her. Maia embodies the concept of growth and motherhood – both apt references for one of the first flowers to bloom in springtime. Lily of the valley is most easily recognized by its single stem of bell-like, white or pink flowers and pair of tall leaves. White (most common) or pink. Sowing Lily of the Valley Seed. Growing lily of the valley from seeds is possible but can be problematic. If you can protect the seeds from hungry wildlife until they are fully formed, you still have to remove the fruit of the berry from the seeds. The berries are quite toxic; be careful when handling them. If purchasing seeds from someone, be sure to cold stratify them in the fridge before planting. Unfortunately, they are generally not known as good germinators and can take as much as a year to grow into a healthy plant. 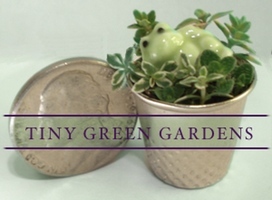 Plant the seeds immediately after harvesting or after cold stratification about 6 inches deep. Many seeds sold as lily of the valley are proving to be for significantly cheaper plants like grass or clover. If that’s not bad enough, others are trying to sell something that does not even exist. 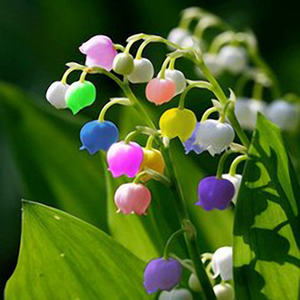 They are selling “colorful lily of the valley” or purple/blue lily of the valley seeds. Simply put, the picture is “Photoshopped” and those pretty multi-colored lily of the valley flowers only exist in the digital world. Please don’t throw your money away by thinking they are real. Lily of the Valley Propagation. 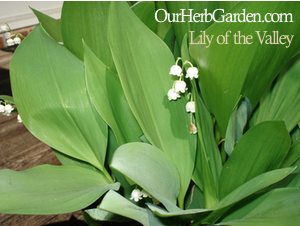 The most common and effective way to propagate lily of the valley is through rhizomes. Rhizomes or pips from an existing colony of plants should be harvested and transplanted in August or September, depending upon your climate. The goal is to transplant after the growing season but before the ground freezes. Plant transplanted pips about one inch deep and six inches apart. If you have purchased pips from your local garden center or online, soak them for a few hours in temperature neutral water – not really cold or warm, around room temperature. Trimming off a little of the bottom of the roots can also help stimulate growth. Lily of the Valley can be potted. This pot has been growing for several years and thriving. Growing lily of the valley in pots works well, particularly if it is early in the season, or if you would just like to grow them inside. In a well-draining pot with a soil mixture with about 1/3 organic material like peat moss, plant the pips about an inch deep. Position the pips in an upright position with some of the dried foilage is poking through the soil. Give them plenty of bright light but don’t put them in a hot, sunny window. 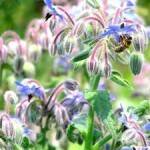 After blooming, plants can be moved into a shady spot in the garden. Lily of the valley prefers partial to full shade. Our colony of plants is in a protected and shady part of the garden. Some are in partial shade and others are fully shaded. The plants that are only partially shaded are not as happy. The leaves yellow and disappear long before the plants that are more well-shaded. With the plants going dormant earlier, they also don’t fruit. Additionally, our plants are part of a section of the yard that is fully covered by periwinkle or vinca. While I have no scientific proof that growing lily of the valley with plants that help shade them and the soil, they do appear to co-exist beautifully. I also suspect the vining nature of the vinca and it’s ability to easily root help prevent the lily of the valley from taking over. Hostas are strong enough to hold their own and also make a good companion plant for lilies of the valley. Before picking an area of the garden to dedicate to growing lily of the valley, I would suggest you consider where these plants are found in the wild. You’ll find lilies of the valley often in heavily wooded and forest-like areas. The soil is extremely rich, contains a lot of organic material and generally stays cool and moist throughout the growing season. Is lily of the valley invasive? The fact that people call groups of these plants ‘colonies’ should provide a clue that they grow and spread. 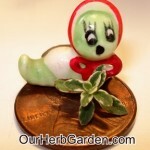 Be mindful of that when you plant these sweet little things; otherwise, they might choke out other plantings. That said, while somewhat invasive, Convallaria majalis has not been identified as a truly invasive species by the USDA. Lily of the valley plants are self-incompatible. 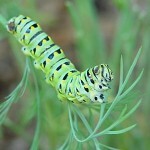 That means a colony of plants that were grown from a single individual (i.e. they are genetically identical) will not produce seeds. They will, however, continue to propagate via rhizomes. My suggestion would be to buy plants from more than one source to ensure your plants produce seeds. Lily of the Valley rhizomes are typically only available in garden centers in the early part of the year. However, they are available online year-round. I found two vendors on Amazon offering lily of the valley pips where the reviews were fairly good and the buyers seemed to actually receive lily of the valley rhizomes. When buying online, read the reviews carefully. One of the vendors I’ve shared with you had a few negative reviews simply because the buyers thought they were buying a blooming plant rather than a semi-dormant rhizome or pip. All parts of the plant should be handled with care as some people have reactions to the saponins and the berries are poisonous to humans and pets. 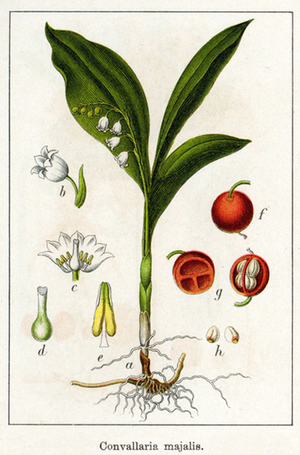 Lily of the Valley contains a number of cardiac enzymes. These enzymes are similar to those found in Foxglove plants and used to create the drug Digitalis. Experienced herbalists utilize lily of the valley in creating treatments for cardio-vascular problems. Poisonous to people and domesticated animals. The scent of lily of the valley is one that is treasured around the world. Unfortunately, the small size of the flowers and the expense involved to mass-harvest them; make it virtually cost prohibitive to use in commercial applications. Sadly, that means that any perfumes or soaps are made with synthetic scents.